Two strong farm sales in the Dannevirke area in late August showed the strength of the local sheep and beef market, says a rural property specialist. Ian Ross of PGG Wrightson Real Estate, Dannevirke and Feilding, marketed the two farms, in conjunction with his colleague, Jim Crispin. “We achieved a good result at auction for a 395 hectare hill country breeding and finishing block that has traditionally carried approximately 3,200 stock units. Located 35 kilometres southeast of Dannevirke, it sold under the hammer on 25 August for $2.05 million, which is approximately 15 per cent above its 2014 government valuation. At the end of a well-contested auction with two motivated bidders, a Wairarapa farmer was the successful purchaser. “Meanwhile, Strathallan, a 262 hectare property that has been owned by a local family for 122 years and is located in the same district, sold for a similar value, also late last month. Slightly smaller, with carrying capacity of 2,850 stock units including a Romney stud, Strathallan changed hands via a private treaty sale and was purchased by a neighbouring farmer,” he said. 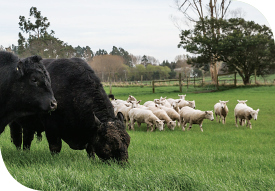 PGG Wrightson Real Estate Sales Manager for the Lower North Island, Mark Gunning, said that the strongest interest in the region at present is in the sheep and beef sector. “With such good red meat returns, low interest rates and the favourable kiwi dollar, there is growing demand for hill country breeding and finishing farms. Potential purchasers are generally from within the wider region. Local farmers are taking the opportunity to commence or expand farm ownership and listings are being well received. “Interest in dairy properties is still good at present although buyers are understandably cautious in their approach, reflecting the current payout,” he said.